Use the chili sauce of your choice. I like to use the sweet red chili sauce. If you prefer, less sweet use Sriracha, but try 1/2 tsp of it to begin with and adjust if you like it hotter. Heinz chili sauce is like spicy ketchup. 1 Peel the shrimp, leaving the tail segments intact. Devein the shrimp if you choose. 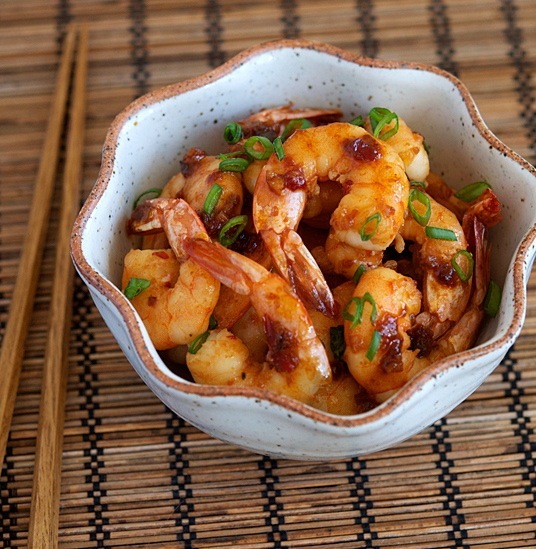 2 In a small bowl, mix together the soy sauce, chili sauce, sesame oil, rice wine, and sugar and set aside. 3 In a wok or large pan, heat the olive oil over medium-high heat. Stir-fry the garlic until fragrant, about 30 seconds. Add the shrimp and cook until both sides are pink, about 2 minutes on each side. Add the sauce mixture and stir so the shrimp is fully coated. Season with black pepper. 4 Remove from the heat and garnish with chopped scallions. Serve with rice or vegetables.